And now, better late than never……. NETWORK UPDATE: Lots of 0.1 increases in final numbers, but not for either half-hour of MR. ROBINSON. The bumps went to the AMERICA’S GOT TALENT clip show, LAST COMIC STANDING, BIG BROTHER, and MASTERCHEF. CABLE HIGHLIGHTS: A&E’s DUCK DYNASTY kept its hold on Wednesday cable, slipping 0.02 to 0.75, with lead-outs WAHLBURGERS up an enormous two-tenths to 0.70 (special event? ), DONNIE LOVES JENNY up 0.14 to 0.49, and LACHEY’S BAR up 0.03 to 0.29. THE GAME (BET) was in 2d place by a tick, up 0.05 to 0.74. 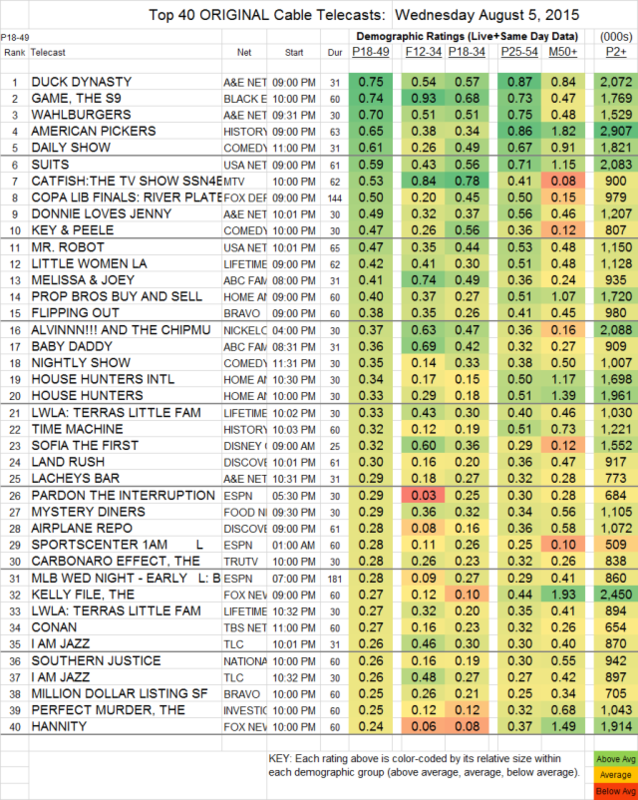 On History, AMERICAN PICKERS gained 0.09 to 0.65, with TIME MACHINE premiering at 0.32. Comedy Central’s penultimate Jon Stewart-hosted THE DAILY SHOW (heavily sponsored by Arby’s, which was showcasing its sense of humor about itself) was at 0.61, with lead-ins KEY & PEELE up 0.18 to 0.47 and WHY WITH HANNIBAL BURRESS up 0.05 to 0.22. On USA, SUITS rose 0.04 to 0.59, and MR. ROBOT gained 0.05 to 0.47. MTV’s CATFISH dropped 0.07 to 0.53 and AMERICA’S BEST DANCE CREW lost almost half of last week’s premiere audience, down 0.19 to 0.21. A FOX Sports 1 soccer match hit the Top 10 at 0.50. Lifetime’s LITTLE WOMEN LA fell 0.09 to 0.42, with TERRA’S LITTLE FAMILY at 0.33/0.27, down from last week’s 0.45/042. At ABCFamily, the series finale of MELISSA & JOEY rose 0.04 to 0.41, and BABY DADDY dropped 0.07 to 0.36, with newcomer JOB OR NO JOB looking like it’ll soon be unemployed, premiering at an awful 0.06 with 138K total viewers. Bravo’s FLIPPING OUT was up 0.02 to 0.38, and MILLION DOLLAR LISTING was steady at 0.25. THE JIM GAFFIGAN SHOW fell 0.05 to 0.16 on Nick At Nite and 0.01 to 0.14 on TV Land, IMPASTOR lost 0.03 to 0.14 on Nick At Nite but gained 0.03 to 0.11 on TV Land, and THE EXES dropped 0.03 to 0.09 in its TV Land-only run, with 343K total viewers. DEUTSCHLAND 83 (Sundance) finished its run up 0.02 to 0.03 with 107K total viewers. BIG BROTHER AFTER DARK (POP) was at 0.05/100K. The DAM report: IMPACT WRESTLING dropped 0.03 to 0.08/327K at 9PM, and added 0.01/42K at midnight (down 0.01). RING OF HONOR aired only at 11PM, and was down 0.01 to 0.03/151K. Due to our late text today, there were several accumulated requests: the 10:30PM IDIOTEST on GSN was at 0.08/275K. FANTOMWORKS (Velocity) was at 0.09/409K. GAMER’S GUIDE (Disney XD) was at 0.06/633K. CAR MATCHMAKER (Esq) was at 0.06/127K. There was no listing for anything called UNSING HOLLYWOOD.